You have bought a star and now you want to know how to find a star in the night sky? The simplest possibility is to use an online planetarium – such as Stellarium. In this you only need to enter the number of your hip-star (eg "HIP 677"). As a result, you get a daily updated star map detailing the location of your star. 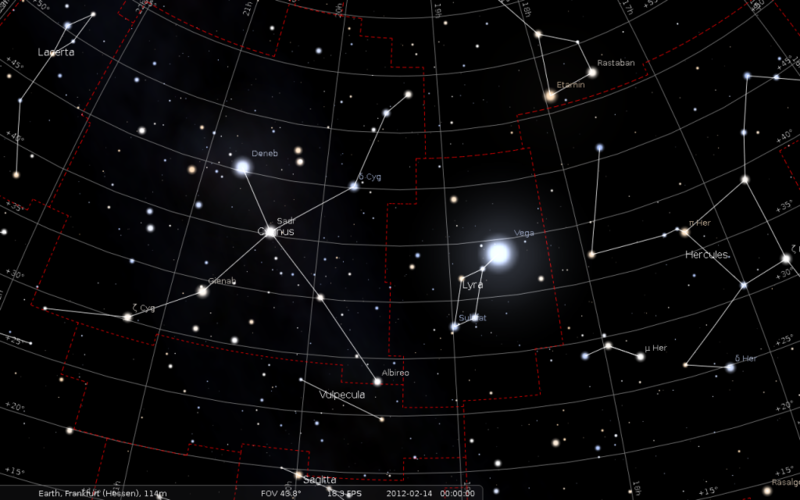 On the right you can see a sample image produced with Stellarium. The picture shows what there is to see on Valentine's Day 2012 at midnight on the northern horizon. You will see two interesting constellations, the beautiful swan, and lyre with Vega, probably the most famous star of the northern sky. With an online planetarium such as Stellarium, you simple can use the search function conveniently search for your star and can indicate where your star is located at any point in the sky. Would you like to be independent from the computer and also in the wilderness, for example, can be found at the campfire or when camping, your star? Then would the acquisition of a rotating star map for the right thing. On a rotating star map set with the help of your date and your wheels turning prehistory. You will then see in what direction and at what level you can see your star. Applying the star map is quite intuitive after some practice. That of a rotating star map enclosed instructions will tell you exactly what you need to do to find your constellation in a flash. The most challenging, but also flexible option is to locate your star without any additional aids. This option requires a little practice, makes you familiar with the firmament, but on a deeper level. When you first have to find the North Star. 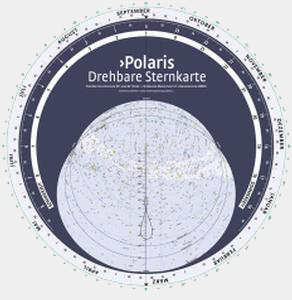 The Polar Star is one of the brighter stars of the northern sky and is located just to the north at an altitude of about 50 degrees. You know, the constellation of large cars? If so, you can use the Big Dipper to find the North Star. You can see how this is done right in the drawing. First locate the Big Dipper. See it at exactly: its seven brightest stars are all different light if you extend the rear of the car five times, you hit the fainter star in the polar Little Dipper. It gives you a fixed reference point. It forms the north celestial pole and is therefore always exactly in the north. With its help you can always find the directions in the sky. Next, pull the information we have provided you with your constellation to rate. Is your constellation by a spring, summer, autumn or winter constellation? Or do you have a star of the Baptist, which is located in a so-called circumpolar constellation? A summer constellation is defined by the fact that in the summer as well, which means as long as possible is to see. This means that you see the sunrise in the summer, your summer constellation in the east at nightfall. During the night, the only constellation to the south and then west walk before it by the time dawn goes down again. For spring constellations and the same applies in the spring, fall for the same constellations in autumn and winter constellations in the same winter. So for example if you have an Autumn constellation, and it also is just the fall, you have it relatively easy. 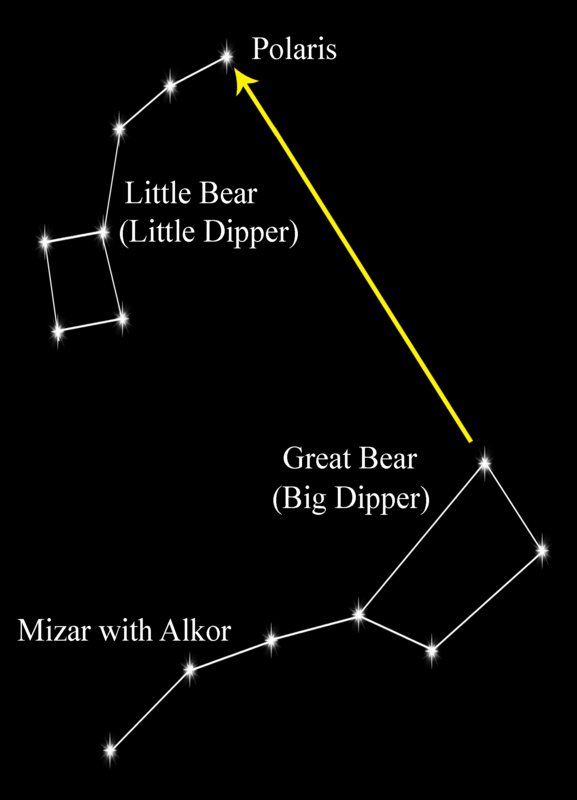 Their constellation can be found at night near the horizon in the east, while it is high in the south at midnight is over the horizon at dawn and again in the West goes down behind the horizon. As it is an autumn constellation, for example, you want to see in winter? It can only be seen by the hour. Because if it's midnight in winter straight, and the winter constellations are seen high in the south, go east since the spring constellations in the first place. And in the West the autumn constellations already going under again. So it is in any other season. The constellations of the past season can be seen only between sunset and midnight, the constellations of the coming season only between midnight and dawn. The constellations of the summer would be observed even in the winter is not. So if you know what season is straight, and you know what time of year can be seen in the constellation of your best, then you can estimate roughly how much you can watch your Clock constellation in which direction. How high above the horizon, you will find, however, Constellation? This information gives you the star of your so-called declination. The information that we give you the information sheet to your star. It applies the rule of thumb, the greater the declination, must seek the higher in the sky you. Before you get started with searching, you shape the contours of your neighbor star constellations and the images well. It is not easy to find a constellation without any tools. However, with practice you will surely stumble over your constellation or one of your neighboring constellations. They have forgotten what your star from the constellation is your baptism? No problem, our detailed star map you can find the exact location. Be patient! Even when clouds are bright stars and bright lights big city to find. Your eyes get used to the darkness. And especially in the winter. Do not underestimate the cold, but make yourself at home with warm clothing and warm drinks.